Take pride in your engine bay or engine? 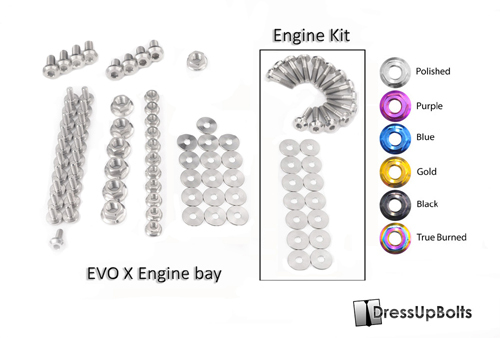 Itâ€™s time to take it to the next level with a Titanium Series Dress Up Kit for your engine bay and engine! These kits are a complete replacement for most visible bolts and nuts on your specific vehicleâ€™s engine bay, ready to bolt in as soon as they arrive. The Titanium kits utilize 6AL-4V Grade 5 Titanium which provides exceptionally high tensile strength, lightweight, and great looks! The Titanium Series fasteners have been tested to be stronger than Grade 8 Stainless Steel bolts, all while maintaining a beautiful anodized finish that will set your car above and beyond the rest in terms of attention to detail. The Titanium Series features our signature head design on all of the bolts large and small for a truly custom look!